Growing tomatoes in containers is an easy and rewarding gardening project for small spaces. Container tomatoes grown on the patio, front step or raised bed are easily as abundant as their garden counterparts. One of the things I like best about container gardening in general is the high degree of control that can be had over the growing environment. A tomato container garden can be easily established and grown without using chemical and inorganic supplements largely because of your ability to easily change it's environment. Most containers can simply be moved to receive more or less light or to an area where they can be babied into full production. Organic growing conditions produce foods that your family can enjoy without exposure to potentially harmful chemicals. 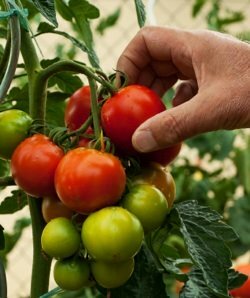 Many tomato varieties lend themselves to container gardening. Growing tomatoes in containers takes a little attention but the results are well worth it. Growing tomato plants in containers requires basic container gardening supplies such as a large and sturdy container, fertile soil, and a trellis or tomato cage. You can start with tomato plants or seeds. Start the seeds in late winter/early spring depending on your location. Wait until after your area's last frost date before setting out transplants. Choose a container sized appropriately for the plants when they reach maturity and that will comfortably hold a cage or hefty trellis to support the tomato plants when they're heavy with fruit. Your container can be constructed of any material you like - glazed or unglazed ceramic, galvanized metal, wood, insulated foam, etc.. As long as it's sturdy enough to withstand the outdoor elements and the weight of the soil and growing plants. Add gravel or broken clay pot pieces to the bottom of the container for drainage. Fill the planter about two thirds of the way up with soil and compost and insert tomato plants (1 or 2). Add tomato stakes, cages, or trellises at this time. Water well. Add more soil to fill the container completely. If you are using seeds, plant them when the planter is 2/3 full of soil. As the seedlings grow, add more soil to make for a sturdier plant. Some tomato plants require pruning, especially when they're grown in a container, it's important to keep the plant squat and bushy so that it doesn't get top heavy at maturity. There are two types of tomato plants: determinate and indeterminate. Indeterminate tomatoes have no set height limit. You have to trim them to keep the plant under control. 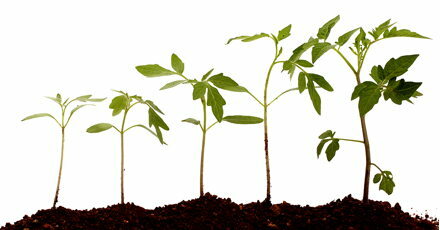 Determinate tomato plants only grow to a specified height. They still require minor pruning, especially in containers. The best way to prune tomatoes is to pinch off the end leaves of stems that are getting too long. Then remove stems that look weak. Finally prune any shoots that form at the bottom of the plant. There should be a single main stem. Harvest tomatoes when they are red and in full color. Remove any damaged fruits immediately. The more you harvest, the more tomatoes you will get. If you need to go away for a few days, pick all of the tomatoes and let them ripen on the counter. At the end of the season, if there are unripened fruits on the vine, pull the tomato plant out of the soil, knock off the dirt from the root ball and hang the plant upside down in the garden shed, porch or basement. Allow the tomatoes to ripen and pick green ones as desired. Bush tomatoes make good container gardening tomatoes because of their compact growing habits. Cherry tomatoes are another good choice. 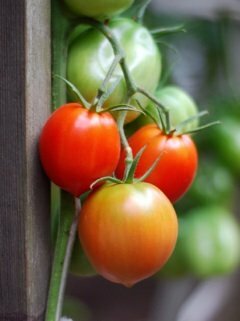 If you have space for several tomato plants try growing grape or currant sized tomatoes for something different. Plum or Roma style tomatoes are wonderful in planters. Just two plants will produce enough to make homemade sauce. A favorite heirloom variety of plum tomatoes is Black Plum. Growing Tomatoes in Containers - Need Containers? Dig through the shed and garage for a clean container that'll hold 10 gallons or more of soil and that's not too tall. You want a stable base for your full grown, fruit bearing tomato plant. Here's an inexpensive option that's perfect for a container tomato garden. 15 Gallon Smart Pot 18"x 14.5" is the frugal gardener's dream. These puppies hold 15 gallons of soil providing lots of root growing room for your tomato container garden and a solid base for the mature plant. The best part is the price, you just can't find containers this size for cheaper. These glass bulbs are an attractive automatic watering device that work on gravity. Fill the glass bulb with water, turn it upside down and push the tube into the soil. When the plant requires water, the water from the glass bulb enters the soil. These actually work and it is easier to see when the glass requires refilling than it is to guess if your plant needs water. Growing tomatoes in containers is a project that anyone can accomplish. The yields from just a pot or two will amaze you. Use your homegrown tomatoes in salads, salsas, and cooking. Growing herbs in containers alongside your tomatoes will increase your tomato yields and add a gourmet touch to your home cooked meals. Visitors to our Growing Tomatoes in Containers page may also be interested in the following pages.